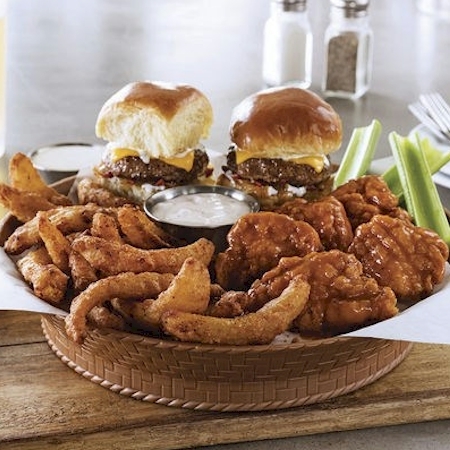 Chili's is a well-known American casual dining restaurant chain that features Tex-Mex-style cuisine, along with sandwiches, burgers and ribs, plus chicken, steaks and seafood entrees. Select three appetizers and enjoy! Served with dipping sauces. Cheese dip with seasoned beef. Served with chips & salsa. Seared chile-rubbed Atlantic salmon, spicy citrus-chile sauce, cilantro, queso fresco. Served with your choice of two sides. Margarita marinated grilled chicken breast topped with house-made pico de gallo & crispy tortilla strips. Served with your choice of two sides. Choose from Avocado-Ranch Dressing, Spicy Wing Sauce, Original BBQ Sauce, Citrus-Balsamic Vinaigrette, Honey-Lime Dressing, Ancho-Chili Ranch Dressing, Fresh Salsa, Mayonnaise, Blue Cheese Dressing, Ranch Dressing, Honey-Mustard Dressing, or Alfredo Sauce. Chile spices, mango glaze & topped with chopped mango, cilantro, pico, avocado. Served with choice of two sides. Choice of Coke, Diet Coke, Coke Zero, Dr. Pepper, Minute Maid Lemonade, Sprite, or Unsweetened Tea. Hot, SAVORY soups and world famous Chili. Topped with tortilla strips and cheese. Topped with Applewood smoked bacon crumbles, cheese and green onions. Our original recipe, filled with beef, onions & signature blend of spices. Topped with shredded cheese & tortilla strips. Flavorful salads with FRESH CHOPPED ingredients. 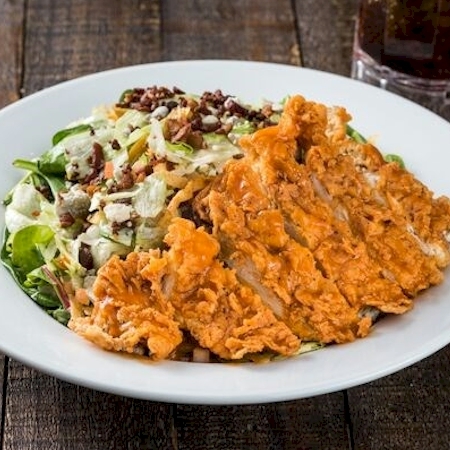 Crispy chicken tossed in spicy Buffalo sauce, bacon, bleu cheese crumbles, pico, tortilla strips with house-made ranch or your choice of dressing. Grilled chicken breast with cheese, diced tomatoes, house-made cilantro corn relish, crispy tortilla strips & citrus-balsamic dressing. Served with freshly toasted 3-cheese quesadillas. Grilled chile-rubbed chicken with spicy Santa Fe sauce, house-made pico de gallo, fresh diced avocado, chopped cilantro, crispy tortilla strips with house-made ranch or your choice of dressing. Fresh, hand-cut pineapple, mandarin oranges, dried cranberries, diced red bell peppers, chopped green onions, cilantro & sesame seeds with a honey-lime or your choice of dressing. Fresh, hand-cut pineapple, mandarin oranges, dried cranberries, diced red bell peppers, chopped green onions, cilantro & sesame seeds with honey-lime or your choice of dressing. Tomatoes, corn & black bean salsa, shredded cheese with honey-lime vinaigrette or your choice of dressing. Your craving ends with our HAND-CRAFTED sandwiches. Served with homestyle fries or choice of side. All burgers served with homestyle fries or choice of side. Fresh lettuce, pickle and tomato included with all burgers except Big Mouth Bites. The burger all other burgers report to. Smoked brisket, tender rib meat, jalapeno-cheddar smoked sausage, bacon & cheddar with lettuce, tomato, House BBQ & house-made ranch. Half-pound patty stacked high with avocado, pepper jack, red onion, roasted jalapeños, tomato, pickles, cilantro & spicy Santa Fe sauce. The original hand seasoned beef patty, seared to perfection. Topped with pickles, lettuce, tomato, red onion and mustard. You can’t top burger perfection, unless you add cheese -- your choice of cheddar, American or Provolone. Topped with pickles, lettuce, tomato, red onion and mustard. Four mini burgers with bacon, American cheese, sautéed onions and house-made ranch. Served with your choice of side. Marbled, thick-cut steak topped with garlic butter. Served with your choice of two sides. 3372. Classic Sirloin - 6 oz. Seasoned & topped with garlic butter. Served with your choice of two sides. Served with your choice of two sides. 3373. Classic Sirloin - 10 oz. Seasoned & topped with garlic butter. Served with your choice of two sides. Served with honey-mustard and your choice of two sides. Served with choice of honey-mustard, BBQ sauce or house-made ranch, and your choice of two sides. Served with house-made ranch and your choice of two sides. Crispers on top of Belgian waffles. Topped with bacon, jalapeños, and ancho-chile ranch. Served with your choice of one side. Served with bleu cheese and your choice of two sides. Three spicy chile-lime shrimp tacos in soft flour tortillas with pico, avocado, cilantro slaw & queso fresco. Served with your choice of two sides. Three enchiladas topped with melted cheese, sour cream sauce, corn & black bean salsa, cilantro. Served with your choice of two sides. Build your own combo! Choose two from our famous Baby Back Ribs, NEW Cheesy Bacon BBQ Chicken, Smoked Brisket, Jalapeño-Cheddar Smoked Sausage, or Chicken Crispers®. Served with chile-garlic toast, garlic dill pickles and your choice of two sides. Build your own combo! Choose three from our famous Baby Back Ribs, NEW Cheesy Bacon BBQ Chicken, Smoked Brisket, Jalapeño-Cheddar Smoked Sausage, or Chicken Crispers®. Served with chile-garlic toast, garlic dill pickles and your choice of two sides. Double up on flavor and feed 2 people! Choose an appetizer to share or two salads, then select two full-size entrees (most of which include two sides), plus a dessert to share! We learned a long time ago you can’t limit chili this good to a bowl. These soft tacos are filled with our Original Chili and will have you partying like it’s 1975. Served with your choice of one side. Three tacos in flour tortillas with pico, avocado, Jack cheese, jalapeño aioli, cilantro, queso fresco. Served with your choice of two sides. Sizzling with chipotle butter, cilantro, bell peppers & onions. Served with Mexican rice, black beans, guacamole, sour cream, pico, salsa, shredded cheese, flour or all-natural corn tortillas. Jack up your fajitas with white queso and pico for a small additional charge. Sizzling grilled chicken fajitas with chipotle garlic butter, chopped cilantro, bell peppers & caramelized onions. Served with 3-cheese blend, guacamole, sour cream, pico de gallo, fresh salsa, citrus-chile rice & black beans. Load Up your fajitas with white queso & pico de gallo for an additional charge. Sizzling steak fajitas with chipotle garlic butter, chopped cilantro, bell peppers & caramelized onions. Served with 3-cheese blend, guacamole, sour cream, pico de gallo, fresh salsa, citrus-chile rice & black beans. Load Up your fajitas with white queso & pico de gallo for an additional charge. Sizzling shrimp fajitas with chipotle garlic butter, chopped cilantro, bell peppers & caramelized onions. Served with 3-cheese blend, guacamole, sour cream, pico de gallo, fresh salsa, citrus-chile rice & black beans. Load Up your fajitas with white queso & pico de gallo for an additional charge. Grilled chicken, sauteed mushrooms, crumbled bacon & mixed cheese. Load Up your fajitas with white queso & pico de gallo for an additional charge. Black bean patty, asparagus, garlic-roasted tomatoes, onions, bell peppers, corn & black bean salsa, queso fresco, and avocado, drizzled with spicy chile-lime sauce. Load Up your fajitas with white queso & pico de gallo for an additional charge. For every main course, there is a PERFECT side. Chocolate cake with a molten chocolate center, topped with vanilla ice cream in a chocolate shell. Big enough to share. Oven-baked Skillet Chocolate Chip Cooke topped with vanilla ice cream and a drizzle of hot fudge. Choose from Blackberry or Mango Iced Tea. Choose from Cranberry Juice, Pineapple Juice or Orange Juice. All kid's menu items served with choice of side and beverage. Burger bites served with choice of side . Crispy Chicken Crispers made with 100% all-natural, white meat chicken and served with choice of side. Grilled Chicken Dippers made with 100% all-natural, white meat chicken and served with choice of side. Kraft macaroni and cheese, served with choice of side.